4 I have brought you glory on earth by finishing the work you gave me to do. So, you and I were created in Christ to complete specific good works that God prepared for us before we were even born. That is mind-blowing! Yet what is more, as with Christ, we actually get to bring glory to God as we seek to finish the work God has given us to do. 13 for it is God who works in you to will and to act in order to fulfill his good purpose”. So, this Easter, consider letting the Holy Spirit, that same Spirit who raised Christ from the dead (See Romans 8:11), empower you to complete the good works he has ordained for you. For our lives are meant for so much more than the mere humdrum daily routine. Look for, and allow the Holy Spirit to enable you to see beyond your routine and so perceive and complete the mission to which you have been called. If you are confused about what your mission calling looks like, I want to encourage you to complete the assessments found at https://www.assessme.org, and read my book: Made for a Mission. May that same Spirit, who raised Christ from the dead, dwell in you and empower you to serve our Lord faithfully. For many churches, volunteer mobilization is a never-ending plea for more help. Announcements in the church program. Announcements in Sunday services. Announcements on the church website. All these announcements may provide some support, but while these volunteers are good-hearted people, are they really the right people for the available positions? Wouldn’t be nice if your volunteer mobilization efforts could move beyond plugging programming holes, to helping people fulfill God’s call upon their life? Well, if you are new to AssessME, get started now by downloading our FREE eBook entitled, BETTER TOGETHER: The Top 5 Strategies for Maximizing Volunteer Mobilization. “7And there was war in heaven. Michael and his angels fought against the dragon, and the dragon and his angels fought back. 8But he (the dragon) was not strong enough, and they lost their place in heaven. 9The great dragon was hurled down—that ancient serpent called the devil, or Satan, who leads the whole world astray. He was hurled to the earth and his angels with him” (New International Version). For most of us, it is in our nature to avoid conflict if at all possible. We despise conflict, particularly the intense conflict war brings. However, the reality is that you and I were indeed born into a world at war. This war has been raging since before the creation of the world. It is a war in which you and I, if we are not careful, may feel like mere pawns, weak and disposable, in an epic game of chess. However, while chess pawns have limited fighting power, their real power is in their ability to get to the opponent’s far side of the board (the back rank) and be promoted into a noble and more powerful player in the game such as a Queen or Knight. Satan would deceive us to believe that we are mere pawns, weak and disposable, in this epic game; that we cannot really make a difference in this world. Yet while this was once true of all of us, we are no longer weak and defenseless. Through our faith in the death and resurrection of Jesus Christ…that God took on flesh and became in every way like one of us: tempted, tormented, rejected, yet sinless and victorious over death, hell, and the grave; and through our public confession that we are sinful and in need of his forgiveness, that he is Lord over all, especially Lord and Master of our lives…we also, through faith in Christ, are now victorious having been promoted through Christ from mere pawns to royalty possessing the very same authority and power that belongs to Christ within his Kingdom. Yet while our status as royal co-heirs with Christ is a reality, we likely do not yet understand how to live as royalty, or rightly wield the weapons that those who are Spiritual Royalty are given by the Holy Spirit to use in this epic warfare. When a biblical pawn is promoted to royalty, through faith in Christ, the new “Royal” must be trained and equipped to effectively apply their royal status, authority, and expanded powers so that they may eventually make a real difference in this fallen world. The Bible refers to this training process as “disciple-making”. 2 Corinthians 10:3-6 (NIV) “For though we live in the world, we do not wage war as the world does. The weapons we fight with are not the weapons of the world. On the contrary, they have divine power to demolish strongholds. 1) We demolish arguments and every pretension that sets itself up against the knowledge of God, and we 2) take captive every thought to make it obedient to Christ. And we will 3) be ready to punish every act of disobedience, once your obedience is complete. As the Holy Spirit leads us, we remove everything from our lives that would keep us from loving our Lord (i.e., we nurture our relationship with God). In the righteousness we have in Christ, we demonstrate our love for God through our obedience to his commands (i.e., we surrender our will/control). This tri-part “strict training” (Relationship, Thought Life, & Will/Control) is required of every pawn who through faith in Christ has been promoted to royalty. This training is a life-long process of learning to surrender self to the transformational work of the Holy Spirit. Please note the respective roles in this training process: We surrender ourselves to the work of the Holy Spirit; the Holy Spirit does the work to transform us, teaching us to surrender self in the areas of relationship, thought life, and will. What is it about little children that Jesus values so much? Certainly, children are far more innocent than adults, and Jesus may be challenging all people to become more innocent. But I think Jesus’ challenge goes much deeper. I believe Jesus is challenging adults to see themselves in this fallen world in the same manner as children innately perceive themselves as demonstrated through their imagination. Children seem to share a remarkable and common understanding that God created them to participate in an epic story as a prince or princess within God’s Kingdom. Reflect back on when you were a child. If you were a girl, did you ever pretend to be a beautiful princess or some other idealized character? Or, if you were a boy, did you pretend to be some kind of victorious prince, knight or super-hero? When I was a boy in the 1960’s, I played-out the prince-role pretending to be a cowboy or playing cops and robbers. Later generations of children, influenced by the Star Wars movies, could often be seen pretending to be Jedi Knights. Children have an innate perception that their lives exist within an epic story of good versus evil. As adults, many of us identify with the characters portrayed in epic stories conveyed in the books we read and the movies we view. My favorite movie is “Lord of the Rings”. I cannot imagine a better portrayal of a good-verses-evil epic story…except one…the Biblical epic. As I watched Lord of the Rings for the first time, I found myself passionately identifying with the Hobbit Frodo on his mission to carry the Ring of Power back to the fiery pit from where it had been made, so that it and its evil might finally be destroyed. I could not help but ask myself, “What did the ring represent in my life…my mission…that I would be willing to live, suffer, and die for it?” For me, epic stories like Lord of the Rings enables me to reenter the world of my childhood and once again see myself as I once did, as my Heavenly Father sees me now…that I am a royal prince on an epic mission quest. This passage is not telling us to “hate” our families, rather this is an Aramaic colloquialism intended to challenge our priorities to the core of our being. Simply put, Jesus is telling us that no one and nothing can come before our Kingdom service and loyalty to Jesus Christ. To hold any family member or even our own lives as a value above the things of Christ is a form of idolatry. God simply will not allow us to have any other gods before him (Exodus 20:3). So we are called to become like little children who are reborn into his Kingdom, adopted as co-heirs with Christ, raised to maturity in Christ so that we may serve our King as royal warriors, fighting a universal spiritual battle to establish Christ’s rule and authority within an ever-expanding Kingdom of God’s grace and mercy. Let’s take a few minutes and review what the Bible has to say about our royal status and position in this world. Please read the following Bible passages, and summarize/personalize each passage in your own words, noting what the passage says about your status and function as a prince or princess called to promote Christ’s Kingdom in this fallen world. 9But you are a chosen people, a royal priesthood, a holy nation, a people belonging to God, that you may declare the praises of him who called you out of darkness into his wonderful light. “I am a chosen person, to serve as part of Christ’s royal priesthood within His holy nation, and I belong to God so that I may declare the praises of Him who called me out of the darkness and into His wonderful light“. 35Who shall separate us from the love of Christ? Shall trouble or hardship or persecution or famine or nakedness or danger or sword? 36As it is written: “For your sake, we face death all day long; we are considered as sheep to be slaughtered.”37No, in all these things we are more than conquerors through him who loved us. How do you see yourself? When you attend a social activity, how do you introduce yourself? How do you describe yourself to others? Does the interaction go something like this? It may be normal in our fallen world to describe ourselves this way, but let’s consider for a moment how the introduction might differ if Jesus introduced us to others at a party…. There’s quite a difference in the two descriptions, isn’t there? The first is rather bland…it certainly doesn’t make David out to be the life of the party. In contrast, the second description seems too incredible to believe…yet it is true. From a Biblical perspective, this is how God views every Christ follower. We are God’s adopted sons and daughters through faith in the person and work of Jesus Christ…who being in very nature God, took on flesh to become like one of us, to suffer like one of us, and to die for the penalty due to us for our sin-nature and sin-acts; on the third day following his death, Jesus was raised to life and has since ascended to heaven where he intercedes to God the Father on our behalf. Through faith in Jesus, we have been adopted into God’s royal family, and so you and I are now also royalty, we are princes and princesses in God’s presence and emerging Kingdom. The Bible describes us as “co-heirs” with Jesus Christ (Romans 8:17). Reflect for a moment on the ramifications of that assertion! We are co-heirs with Jesus…everything that is his (status, power, position, authority, glory, and suffering) belongs to us as well! Sadly, however, few Christ followers live their lives based upon their royal position. In fact, to a certain extent, I believe we are all guilty of living short of our royal status. All of us live like the hero in the story: “The Little Princess” (Frances Hodgson Burnett, St. Nicholas Magazine, 1904) whose father possessed great riches, position, and power; yet in ignorance of her inherited status, the princess lived in poverty and servitude. How we perceive ourselves…our self-image…impacts all our life choices, values, and goals. If I see myself as a princely warrior who serves in a vital capacity within an epic battle, then my life decisions will support my self-perception. If I perceive myself as just a “Ministry Systems Designer”, then my life decisions will support that version of my self-perception. If I perceive myself to be weak and of little value, as Satan would deceive me to believe, then based upon that belief I would cower from accomplishing anything of value for Christ’s Kingdom. From God’s perspective, you and I are indeed princes and princess warriors with vital mission assignments intended to help take-back this fallen world for Christ. It is important that we perceive ourselves correctly, the way God intends. A healthy Biblical self-image is essential not simply because God adopted us as royalty, but also because our unique design points us in the direction of the mission-purpose God intends for us. God designed us exactly the way we need to be to accomplish the ministry mission he ordained for us. I also believe the more we learn to appreciate our unique design, the more we will learn to appreciate our unique Designer, whose image we were designed to reflect. Small groups can be a wonderful venue for launching and supporting AssessME.org within your church. However, to be successful with AssessME.org, it should not simply be seen by staff and the congregation as merely a small group learning or discussion series. Churches that are successful with AssessME.org make AssessME a fully integrated part of their church culture. Let me first discuss benchmark small group strategies, and then how to successfully integrate AssessME.org into your church culture. It is easy to use your small group program to help launch your AssessME.org assessment program. Your group leaders need only to share with group members your church’s unique Assessment Page URL, see samples below. And if activated, the Registration Code Key (Warning: Activating the Code Key will significantly reduce the numbers of people in your church who will register and take the assessments). Your small group leaders should be equipped to introduce each assessment and be able to explain why each assessment is important. The ePersonality – Built upon the proven Myer-Briggs construct, it is a sociologically validated assessment, with a proven 89% accuracy rate. All other assessment results are judged accurate in as much as they agree with the ePersonality. The GraceGifts – The GraceGifts assessment provides “Gift Expressions” which are personality defined ways the people will make use of their gifts. Leadership Style – Helps explain how the Body of Christ, and its many parts, fit together in team-based ministry service. Organic Skills Tracking – Enables your people to create skill categories and micro-resume’s related to their skills. Our skills are an outgrowth of the personality God has given us. Our personality determines the kinds of experiences we like or do not like. The experiences we like, over time and through experience, formulate as skills. NextSteps Disciple Making – Helps church staff to meet you at your point of need to help your faith in Christ to grow stronger and your relationship with Christ, more intimate. If using Church Community Builder, then create “JOBS” with assigned AssessME.org assessment report title types. People who match each JOB Profile will view the posting within their account and may “APPLY” for the position. 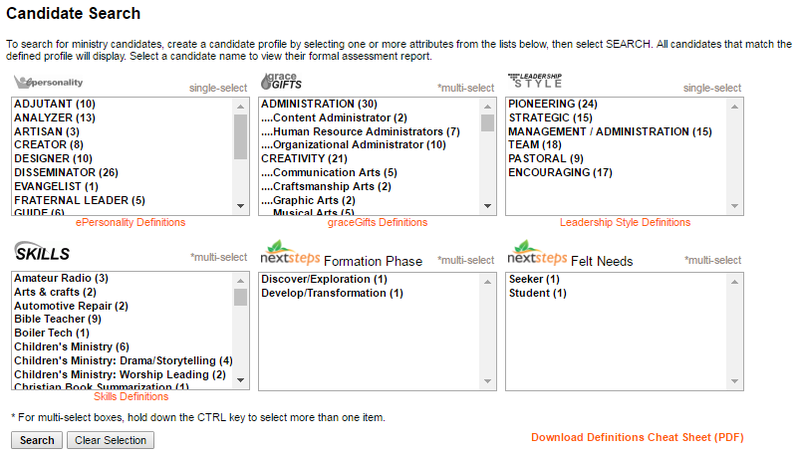 Leadership makes use of the AssessME.org Candidate Search Function to define ideal profiles based upon combinations of personality, spiritual gifts, leadership style, skills, and spiritual maturity, for any ministry service role. The result will be a short-list of matching candidates that leadership may relationally and proactively meet will to explore whether God may be calling any of the people on their short-list to the available service functions. In fact, an ideal follow-up plan would include all these strategies. A more challenging benchmarked small group model uses group leaders to facilitate a small group study through the book, Made for a Mission. David A. Posthuma wrote this book specifically to serve as an equipping tool for AssessME.org users. The book includes personalized workbook pages that help each reader interpret and apply the AssessME.org reports to their own life and ministry calling. By the end of the book, each reader will understand why God created them as he did, also, the general purposes for which they were created, and the kinds of people they need to partner with to maximize their ministry impact. Small group leaders would greatly benefit from weekly pre-training sessions where the staff member overseeing all small groups would model how they would teach through that week’s upcoming chapter. In addition, small group leaders should be pre-equipped with sample questions to ask which will help facilitate sharing and discussion. They would also benefit with suggested answers to commonly asked questions. If Using Church Community Builder, Then Create “JOBS” with assigned AssessME.org report types. People who Match Each JOB Profile Will View the Posting within their Account and May “APPLY” for the Position. Leadership Makes Use of the AssessME.org Candidate Search Function to Define Ideal Profiles for Any Ministry Service Role and to Build Effective Teams. The ideal follow-up plan would include some combination of some or all these strategies. Today it is common for churches to challenge their small groups to serve together in various community service projects. While these service projects are wonderful group bonding and service opportunities, these experiences are not what AssessME.org means by “Volunteer Mobilization”. Our goal is to help each person identify and ultimately fulfill God’s calling upon their life. In all honesty, this is a task that is likely beyond the scope of most small group leaders. Our philosophy asserts that how God designed a person points them in the direction of the kinds of ministry service that would best fit them. However, identifying one’s life-calling may yet be years away. The goal at present is to help church members practice and perfect the kinds of ministry service roles that fit them best. Additionally, your people need to learn how they best fit within a ministry team, and to serve that team with humility and excellence. The average person does not know how to serve in partnership with other people. Some people have authority issues and do not presently serve well under the authority of appointed leadership. These are growth traits that make take years to mature. For this reason, we have not yet observed a successful benchmark church program that relies solely on its small group leaders to mobilize each of their group members to fulfill their life’s calling. At most, a small group can provide general support, encouragement, counsel, and prayer. The most important implementation strategy is to appoint a leader who will oversee the equipping of all pastors, staff, and key lay leaders on how to use AssessME.org to find the best candidates and build effective teams. This role commonly falls under the function of a Human Resource Administrator or Volunteer Coordinator. This person must ensure that your church leaders do not view AssessME.org as one of many church programs. For, if AssessME.org will succeed within your church, it must integrate into every program your church offers. Every pastor must be assessed before hiring. Every prospective staff member must be assessed before hiring, and every volunteer must be assessed before mobilizing them into service roles. But creating an AssessME.org culture within your church goes much further than having everyone take the assessments, your pastors and staff must be equipped to use AssessME.org to personally search for prospective ministry candidates, and use the AssessME.org data to build effective teams. The Human Resource Administrator or Volunteer Coordinator must serve as the ministry’s primary source for leadership equipping so that every leader within your church is equipped and able to identify appropriate ministry candidates and to mobilize them within their sphere of ministry responsibility. In this way, the Human Resource Administrator or Volunteer Coordinator does not function as a bottleneck that controls mobilization, but rather as an equipper who trains and releases all other leaders within the church to mobilize as many people as possible into Kingdom ministry service. “So here is the thing about programs. They don’t work. Programs don’t work – communities do. Programs are for communities that have forgotten how to be communities.” (https://millennialpastor.net/2013/11/07/want-to-kill-your-church-start-a-program/). While I appreciate Rev. Parker’s relational emphasis, and I strongly affirm that ministry happens best in the context of authentic relationships, I believe his blanket devaluation of ALL church programming is unfortunate and somewhat misinformed. Not all programs are bad. Granted, many of our church programs have outlasted their effectiveness years ago. But what Rev. Erik Parker’s seems to suggest in his greater article, is that he believes that church programming creates artificial communities that cannot function as effectively for Christ as “authentic communities naturally do”. To a point, I agree with Rev. Parker. Church programs are artificial communities. The issue then is to determine if authentic-community can occur within a church’s artificial community programs? Rev. Parker insists that this is not possible, I want to suggest that it is not only possible, but authentic-community does occur within well-developed church programs on a regular basis. In fact, I would go so far to say that if a church refuses to develop organizational systems, they will relationally alienate a large percentage of the Christian population. Since the early 80’s, the Boomer generation has utilized a church growth method that offered programs designed to target demographic affinity groups: A children’s ministry for children, a teen ministry for teens, and a young married ministry for young marrieds, etc. Boomer church leaders hoped that by bringing people together of like life-stage, relationships would form, and interpersonal ministry would eventually trickle-down to the personal level (See: Illustration 1). While affinity groups are great Christian socialization strategies, they have proved to be poor disciple-making strategies. As a result, many Millennial church leaders want to flip this traditional ministry methodology away from targeting affinity-groups and instead focus on loving individuals within the context of small inter-generational and inter-cultural communities. The goal is that the more people we love, who then authentically love others, the more Christ’s Church will grow without any need to focus on demographic life-stage, nor discipleship life-stage. I refer you to Illustration 2 below. In theory, these loving communities will grow because all people need and desire love and acceptance. So, in theory, these communities claim to better reflect Christ’s disciple-making methodology…after all, Jesus loved to hang out with sinners. And while I affirm these community objectives, there is one glaring sociological dynamic that the community-ministry-model overlooks…According to the Myers-Briggs assessment construct, 43% of the human population have different social needs than the community-ministry-model can typically address. Please allow me to explain. 57% of the population “Relate to the World Around Them” through an ADAPTIVE set of values (See: Illustration 3). This means that a small majority of people do not value systems, plans, or programming structures. Adaptive people tend to be relational people who can easily flex with life’s opportunities and demands. These people can easily fit and function within Pastor Parker’s “Communities”. 43% of the population “Relate to the World Around Them” through SYSTEMATIC values. Systematic people require multi-layer organizational structures, plans, and programming systems to help them know how they may fit and contribute to the organization. Systematic people quickly tire of pure relational communities that are not linked to a defined missional purpose. Furthermore, and possibly most importantly, systematic people typically build relationships through working with other people to accomplish a shared mission objective. I, for one, feel closest to those who serve and sweat side-by-side with me in our shared goal to expand the Kingdom of Christ in this broken world. It is difficult for may systematic people to simply build “social” relationships. In fact, their strictly social pool is quite small, consisting generally of family members and a few close friends. Systematic people generally consider the people they work with regularly, either on their job, or within a ministry program, to be their friends. For systematic people, working together to accomplish a noble task is their natural foundation for building any “authentic” friendship. In contrast to systematic people, relational-adaptive people form relationships with people simply because “people” are their mission. They need no task-oriented purpose to serve as a pretext for relationships. Sadly, however, relational-adaptive people tend to project a superior attitude within our present-day church-culture. They often assert that their way of doing ministry is the best way. In fact, I have personally experienced many relational-adaptive pastors exclaim that their ministry methodology is the ONLY way to do ministry. Or, again, that their way of doing ministry is most “Christ-like”. Relational-adaptive pastors naturally create churches which are organizationally flat, and so emphasize relational community over organizational systems and programs. As a result, these ministries fail to build relational communities that include systematic people (43% of the population). These people quickly grow tired of the relational-adaptive church’s high social demands and lack of focused purpose. They struggle to discern how they fit within the flat community. But, here’s the big reveal: Relational communities can exist within organizationally programmed systems, but these programmed systems cannot exist within a flat relational organization. But, here’s the big reveal: Relational communities can exist within organizationally programmed systems, but these programmed systems cannot exist within a flat relational organization. It is hard to believe any pastor would intentionally reject 43% of the population simply because the needs of these people conflict with the Pastor’s relational-community ministry paradigm. But it happens all the time. Many small churches remain small because their pastors refuse to move beyond their purely relational ministry model and integrate the organizational systems necessary to include systematic people. As an example, over ten years ago a pastor of a church with about 120 people attending asked me to consult regarding why his church was not growing. He commented that if they could have retained all their visitors over the previous decade, they would be larger than 1,500 in attendance. When I explained to him the systems and structures that would be needed to be inclusive of systematic people, his response was literally hostile. He declared, “That’s not relational ministry, it will never happen as long as I am pastor of this church!” And so, his church remains about 120 people to this very day. So, can we at least agree that it is just as wrong to declare: “Do You Want to Kill Your Church…Start a Program”, as it would be to say, “Do You Want to Kill Your Church, Start a Community”? I believe that when we respect God’s created order, which includes different kinds of people with differing needs and abilities, we then respect God Himself. Authentic community is the goal. But communities which accept only flat relational-organizational structures, are not authentic communities, they are in fact sectarian communities at best. 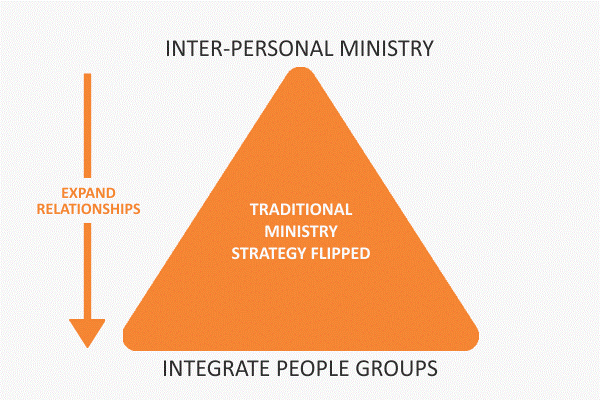 If we can accept the premise that church programs can be beneficial to many people if they are properly developed and supported, then our task now is to flip the traditional church program paradigm, from programs that focus merely on treating people as members of a social affiliation group, which hopes that disciple-making will somehow occur, to programs that intentionally and strategically support the relational disciple-making process. Have you ever had a nagging feeling that you forgot something? Many ministry leaders have this nagging feeling as they are preparing for their ministry programming for Fall Kick-Off. They may question: “Do I have the right people on my teams”? Or, “Do I have the right people in their most effective positions”? If you use AssessME.org correctly, there should be no doubt that you have the right people, in the right positions, and in the right teams. But when I say “correctly”, what do I mean? Please let me illustrate how I build my teams using AssessME.org. I almost always begin my search for candidates using the Leadership Style Assessment. The first question I ask is, “Do I need a Builder, a Manager, or a Nurturer for this position”? A related consideration is whether I am building a new team or adding a team member to an already established team. For now, let’s focus on my process for adding a member to an established team. If a team member leaves, the ministry program can continue under the care of the remaining team leaders. Ministry stability and sustainability are crucial considerations when seeking to expand ministry impact from year to year. Team-based leadership empowers team members to serve out of their God-given strengths, rather than struggle to compensate for the leader’s inadequacies. 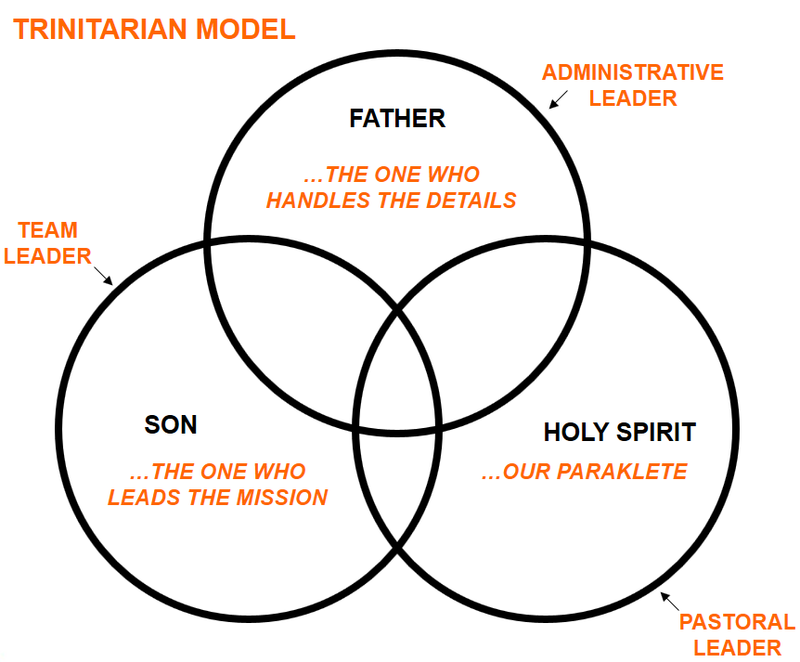 A leadership team model based upon the Trinity. I believe that the functional roles of the three persons of the Trinity should be reproduced within every leadership team. Does my team have a Team Leader…like Jesus? Does my team have an Administrator…like God the Father? And does my team have a Paraclete…someone like the Holy Spirit to care for the team members and the people the team ministers too? My ideal is to find this “Three Strand Chord” of leaders for every ministry program. So, if I need to add a person to an established team, then I consider what role is lacking. Using the Candidate Search Engine within AssessME.org, I simply sort my data base by the desired leadership category. To dig deeper, please read my book, Made for a Mission, which goes into far greater detail explaining the team building process. Once I have filtered my database for the desired leadership style, I consider the available flavors of personality represented within my defined candidate pool. Think of a personality type as one’s style of service. So, for example, you may have searched previously for a Team Leader. There are numerous flavors of Team Leaders. We need to find the Team Leader who has the best temperament for the specific needs of the ministry under consideration. One church of about 400 people had the following personality-type results for their Team Leaders. Consider the eight “flavors” of how these different Team Leaders would function: (Note: The number following the title represents the number of people). Each of these Team Leaders brings a different set of skills and temperament into the ministry context. It is important that we position the right kind of Team Leader into our team example. Spiritual Gifts are Holy Spirit enhanced abilities that are related to one’s God-given personality. There is a direct relationship between gifts and personality. So why do I wait to consider spiritual gifts until step 3? Because ALL spiritual gift assessments have fundamental assessment flaws. They are based upon a combination of interest and experience questions. Just because you might have an interest in a ministry area, does not mean you are truly gifted accordingly. And, just because you may have done something before, does not mean you did it well, or should have ever been serving in that capacity in the first place. Most spiritual gift assessments are only about 60% accurate. Therefore, we provide our personality and leadership style assessments to serve as a check-and-balance against our spiritual gift assessment results. You should expect a consistent pool of gift results among the people you have so far narrowed in your database search. Spiritual Gift results serve as a confirmation of ability and style for the role you are seeking to fill within your ministry team. One of my last considerations, can from time-to-time, become the top search criteria. Do I need a doctor? Do I need an electrician? Do I need a Lawyer? What skills are desirable for our Team Leader to make the final cut? In the spirit of “The last shall be first”, I consider the candidate’s NextSteps Assessment reports for both spiritual maturity and felt-need issues. My first consideration is what level of maturity in Christ is required for this position? Some churches require that all leadership candidates must have reached the “Deploy” phase of spiritual maturity. While others consider the Develop phase of spiritual growth sufficient for leadership positions. It is wise for a church or ministry department to define a policy so that a consistent requirement standard is maintained. The second consideration is the candidate’s felt-need report. Felt-needs may be positive, such as a great desire to serve the Lord, or negative, such as being wounded by a recent divorce. I tend to set aside all candidates that have a current negative felt-need status. In most cases, I believe it is time for them to heal and grow through their present challenges. However, in some cases, it may be of great benefit to a person experiencing a negative felt-need, to serve other people so that their focus is placed on the things of Christ, rather than upon themselves. These cases require spiritual and emotional discernment. However, in general, I prefer to recruit leaders who demonstrate a consistent positive felt-need status. While at first read, using these five steps for adding a member to a team may seem complicated. However, with a little practice, these steps will soon become a part of your everyday experience. And in doing so, you will find that your leadership teams will be more effective, and your team members will experience greater satisfaction as they serve their Lord and His people. My prayer is that your ministry will experience a successful Fall Kick-Off, and I hope AssessME.org will be a contributing partner to your success. https://www.assessme.org/wp-content/uploads/2016/05/AMlogo2-300x65.png 0 0 David Posthuma https://www.assessme.org/wp-content/uploads/2016/05/AMlogo2-300x65.png David Posthuma2017-08-14 13:58:232017-11-02 10:49:49Ready for Fall Kick-Off? Your People are an Army! Your people, those who attend your church, represent an incredible Kingdom army. Sadly, however, most of the army remains in basic training and are never released to fight in the battle. They want to serve, but church soldiers often do not understand how they are to serve. 2 Corinthians 10:4 states: “4 The weapons we fight with are not the weapons of the world. On the contrary, they have divine power to demolish strongholds.” One of the strongholds that often keep people immobilized, is a lack of clarity regarding God’s purpose for their life. In fact, the #1 question on the heart and mind of every person is, “Why am I here…why did God make me like this?” My staff and I live to help people discover the answer to that vital question. God doesn’t want to keep us in the dark about our life purpose? In fact, I believe that our unique design is an intentional creation of God, perfectly suited for the “good works God has prepared for us” (Ephesians 2:10). So if we want to know what kind of good works we are to accomplish, a significant first-step to discovering this answer is found in the talents, skills, and abilities that come naturally to us. God will never ask us to serve him in a way that is contrary to his design for your life. I learned that lesson the hard way many years ago when God called me to plant my first church. From previous experiences, I discovered that the Lord designed me to be a driven visionary with strong strategic planning abilities. As such, I can cast a noble vision for people, and help them plug-in. The new church was going great. We were rapidly growing in size. We also were blessed to have many adults come to know Jesus Christ as their Lord and Savior. However, all of our momenta was stalled in one day due to the destructive behavior one person. Unknowingly, this person had previously destroyed three churches in Arizona. She now set her sights on targeting our church. The church survived the attempts of this person to destroy it, but we were scared and hurt. My district superintendent counseled me to lay off the church planting process, and just shepherd my people for a year or more to allow them to heal. I tried my best, but full-time shepherding is not a gift typically found in most visionary entrepreneurial pastors. My stress level was off the charts. Night after night I would plead with God, “Lord, please make me a kinder and gentler pastor so I can care for your hurting people”. One evening God finally responded. It wasn’t in an audible voice, but in an overwhelming impression: “If I wanted you to be a kinder and gentler pastor, don’t you think I would have made you that way?” I realized at that moment that my superintendent was asking me to do something God never designed me to do. If indeed this church now needed a shepherding pastor, then I needed to step aside and allow the church to search for a pastor with the temperament and gifts they now required. Understanding our design, helps us know how to say “yes” to service opportunities that fit who we are, while also giving us permission to say “no” to service opportunities that are not in line with God’s design for our lives. Understanding one’s “Ministry Temperament”, that is your God-given design for ministry service, is the first crucial step pastoral leaders need to address if they ever want to move their army out of basic training and into the battle. https://www.assessme.org/wp-content/uploads/2016/05/AMlogo2-300x65.png 0 0 David Posthuma https://www.assessme.org/wp-content/uploads/2016/05/AMlogo2-300x65.png David Posthuma2016-10-05 16:23:342018-10-05 12:14:04Your People are an Army!